More Titles in This Series! Description: Teachers and students across the country and across the curriculum are creating informative and eye-catching presentations with Microsoft's best-selling PowerPoint slide presentation program. Trainers agree that Janet Caughlin's just-released PowerPoint Workshop for Teachers is the best tutorial on the market--bar nonefor unleashing the power of PowerPoint into your classroom. Janet has poured her expertise as a nationally respected K-12 trainer and author, as well as her 29 years of classroom experience as a teacher, into this resource. It's your quickest introduction and best reference tool for PowerPoint. Following the same style that has made Janet's AppleWorkshop series a runaway best seller with teachers, the step-by-step lessons in PowerPoint Workshop for Teachers contain tons of screen shots and clear visuals. You follow right along on the computer, using templates you open from the accompanying CD-ROM. Each activity teaches a few new ideas and reinforces ideas taught previously. This book has been carefully designed to help both first timers as well as advanced users make better use of their valuable teaching time. You can learn at your own pace. Trainers can print individual lessons to teach specific PowerPoint concepts, or they can use the book as the basis of a complete stand-alone class or training unit. 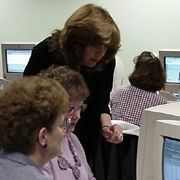 PowerPoint Workshop for Teachers is the only PowerPoint tutorial for teachers that has simultaneous and complete coverage of both the Macintosh and Windows versions of PowerPoint 97, 98 and 2000. Whether you are a teacher trainer dealing with different versions and/or platforms or just looking to understand what's new in 2000, you will appreciate this book's seamless integration and focus on all the key differences. This book covers all aspects of creating a dynamic PowerPoint presentation from start to finish. PowerPoint Workshop for Teachers also covers advanced topics like inserting sounds, publishing to the web, sharing presentations, and using viewers and converters. - PowerPoint Book is Here! This book contains files created by teachers around the country, from every grade level and subject area, showing you how they use PowerPoint to meet their curricular objectives. There are carefully selected, teacher-tested lesson plans for a variety of grade levels and fantastic student project examples, too! The accompanying CD-ROM is packed full of one-of-a-kind, practical resources to make it easier to incorporate PowerPoint into your classroom. In addition to the customizable teacher and student presentations in the book, there is a sound library and a collection of images including amphibians, pets and famous people for students to use in creating presentations. ATTENTION Administrators: Give your trainers even MOREsee how easy it is to schedule Janet for a customized, in-person PowerPoint training, based on this book. Macintosh: LC 475 or better / 25 MHz / 5 MB RAM (16 MB for PowerPC), System 7.1 or higher, 13" 256-color monitor / 640x480 resolution, CD-ROM or DVD-ROM, PowerPoint 98 or 2000 program (not included). Windows: 386SX CPU or higher / 16 Mhz / 8 MB RAM /, Windows 95 or higher, 13" VGA monitor / 640x480 / 256 colors, CD-ROM or DVD-ROM, PowerPoint 97 or 2000 program (not included). The lessons are straightforward and easy to executeyou just start your PowerPoint software...and use the book as a step-by-step guide. The 'real' presentations are very useful for generating ideas. ****"
"If you are ready to learn PowerPoint, but like to learn at your own pace, then make this manual a part of your professional library. The author has done a tremendous job in ensuring that the manual is easy-to-follow, fexible to both platform and version of software, and helpful in providing ideas for improving teacher and student presentations." T.H.E. Journal, June 2000. Read the entire review. An outstanding resource for teachers and administratorsthis book should be in the hands of anyone who uses PowerPoint." "Wonderful! Supplies you with great ideas." "Good inclusion of student project examples helped me to better organize my current PowerPoint project for 5th and 7th grades. I love the CD-ROM with the book  the graphics are super! A wonderful resource with lots of good, practical ideas." "Easy to use and clearly written." "I would recommend anyone who wants to incorporate PowerPoint presentations into their curriculum to use this product." "A great tool to assist in getting the best out of PowerPoint." "Non-threatening for low-level abilities. Great for the novice and the seasoned user." "A valuable asset for any teacher of any age level. Excellent graphics." "Really neat! You can use it more than you think." Partners | Software Tutorials | Training | Where's Janet? Problems or comments about this site? E-mail us. We're here to help! Copyright © 1999 Janet Caughlin. All Rights Reserved. Legal Notices. without the express written permission of Janet Caughlin.